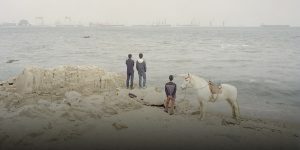 The photographer captures the beauty and sorrow of China’s Yellow River and how it represents a changing society. This article is part of a series on some of China’s most renowned photographers. No natural landmark carries as much cultural significance to the Chinese as the Yellow River. From its remote source in the Tibetan plateau, the country’s second-longest river runs 5,500 kilometers through nine provinces. Thanks to its vast, fertile floodplain, the river is frequently invoked as the cradle of Chinese civilization. Today, it supplies water to 100 million people, 190 million acres of farmland, and thousands of factories in northern China. The historical importance of the Yellow River is what drew Zhang Kechun to document life along this majestic waterway. Starting in eastern China’s Shandong province, where the river discharges vast amounts of water into the sea, Zhang slowly traced it westward over several month-long trips. He took time to observe his surroundings, sometimes going a week without pressing the shutter. The strenuous pilgrimage took two years and carried him across many of northern China’s distinct landscapes: the mountainous terrain of the river’s upper reaches; the sandy, golden soils of the Loess Plateau; and the low-lying floodplain at the river’s mouth. He did it all on a collapsible bicycle, while carrying a cumbersome Linhof camera weighing 3.5 kilograms. Zhang did not grow up along the Yellow River; he was raised in Chengdu, in southwestern China’s Sichuan province. Nonetheless, he was inspired to photograph the river after reading the 1984 novel, “Rivers in the North,” by Zhang Chengzhi. Set after the end of the Cultural Revolution, the protagonist dreams of becoming a geologist and journeys along the rivers in northern China before applying for his master’s degree. Moved by the protagonist’s passion, Zhang Kechun, who was then unsatisfied with his job as a commercial photographer, decided to take a leap of faith. In Zhang’s photographs, the sky, river, and earth are curiously blended in a calm palette of yellow and grey, adding a tranquil, surreal touch. He cited landscape paintings from the Song Dynasty (960-1279) as a source of inspiration. To achieve the muted tone of those artworks, he shot mostly on cloudy days and slightly overexposed the pictures. The images radiate serenity, but beneath them flows a tense undercurrent of the river’s modern sorrow. The Yellow River has changed course several times over the span of Chinese history, the last time in 1855, causing disastrous flooding and taking countless lives with its silt-filled water. But today, drought, excessive farming, and breakneck industrial development have drained the river considerably, and the region is embattled by pollution and soil desertification. Several times over the last few decades, most recently in 1997, the river has run dry before reaching the sea. Zhang had set out to portray an idealistic image of the river, but soon realized the region’s many challenges are impossible to ignore. Zhang remains optimistic about the Yellow River’s future despite its environmental destruction in recent decades. The river has been flowing for millions of years, and the current period of zealous development won’t last forever. In 2014, “The Yellow River” won the Discovery Award at the Rencontres d’Arles, a prestigious photography festival held annually in France. The award garnered him international attention, and the project was widely exhibited at galleries and photo festivals across the world. Contributions: Ding Yining; editor: Matthew Walsh.